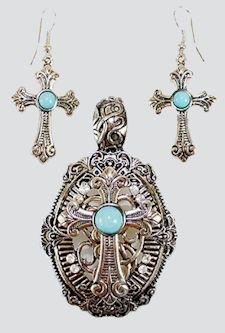 This turquoise cross necklace and earring set has a silver finish with a cross with a turquoise stone, and fancy scrollwork. The pendant has a magnetic clasp. It comes with matching earrings. The oval pendant is 1 5/8" wide (4.1 cm) by 2" long ( 5.1 cm), not counting the bale. The earrings are .75" wide(1.9cm) by 1" long (2.5cm), not counting the hypoallergenic french earwires.